Oh, what’s that? You need me to process a huge file and spew out the data plus its Base64? I’d better write a new .Net proje-OH NO WAIT A MINUTE I DON’T HAVE TO ANY MORE! ScriptCS is C# from the command line; no project file, no visual studio (.. no intellisense..), but it’s perfect for little hacks like these. And you’ll end up with your output; minimal fuss and effort. Setting up a development PC can be a bit of a pain, unless you’re smart and create an image following the setup of a brand new vanilla install. But who’s organised enough to do that?! I’ll get onto that option in another post, but this one is more an excuse to play with interesting stuff. I thought I’d have a play with coding up a set of scripts to do as much of this setup as possible instead; there are a few tools out there to do this sort of thing, and I’ve gone with ninite, webpi, and chocolatey. 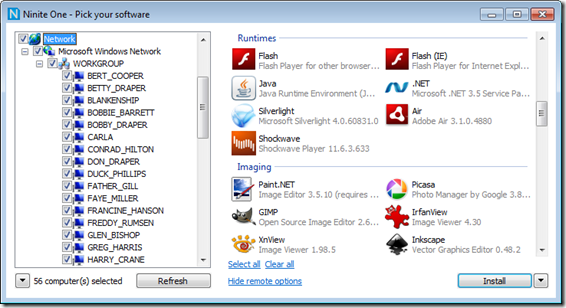 For an ASP.Net developer PC I’ve gone with Chrome, Safari, Opera, Firefox, Skype, VLC, Flash, Air, Java, Silverlight, Launchy, 7-Zip, WinSCP, PuTTY, Notepad++, WinMerge, Paint.NET, PDFCreator, Reader, DropBox, and Everything Search for my installer. This installer can be called from the command line but the basic version still opens a graphical interface; however no interaction is required. The Pro version comes with a command line installer, but I’ll not be using that. Ninite Pro is absolutely awesome: you can remotely manage installed software and software patches within your network with a silent install process. 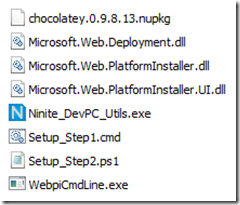 Scripting the setup of a developer PC, Part 2 of 4 – Installing Frameworks and Components with WebPI.